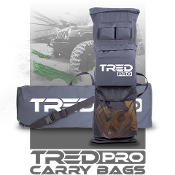 TREDs are the ultimate all-in-one 4x4, ATV and equipment recovery device in sand, mud, sludge, slime or snow. Designed and manufactured in Australia from specifically engineered polyolefin materials, TREDs can handle intense levels of torque, flex, weight and impact. 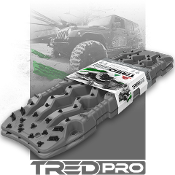 With a designated shovel feature, extreme hex grip nodules, dual size offering, aggressive ramp entry teeth and ultimate wear resistant properties, TREDs are the best option to get you going when loss of traction disrupts your journey. TRED PRO MOUNTING BRACKET TRED 800 GREY RECOVERY & EXTRACTION DEVICE (LENGTH 31") TRED 800 DESERT SAND RECOVERY & EXTRACTION DEVICE (LENGTH 31") TRED 800 MILITARY GREEN RECOVERY & EXTRACTION DEVICE (LENGTH 31"